Feeling in the mood to do a little remixing of classic pieces of art? You’re in luck: The Metropolitan Museum of Art has just made hundreds of thousands of pieces available under the Creative Commons Zero license, meaning they can be used pretty much however you see fit. The collection is basically any digitally catalogued piece that curators have determined is in the public domain. So really these were already out of copyright, but that doesn’t always mean they’re available in high quality and use in whatever circumstance officially sanctioned. 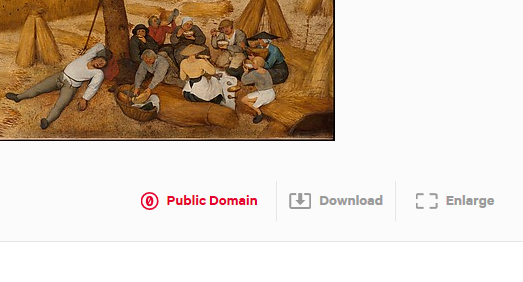 Just look for the “Public Domain” and CC0 logo below whatever piece you’re thinking of using. Guess where I found the image at top? In addition to the license change, the museum has also collected metadata for its digitized collection under this GitHub account. And they announced partnerships with Creative Commons, Wikimedia, Pinterest and others (details to follow, apparently). The Met, like many other museums, libraries and institutions of learning, has been pushing to make its collection available online to as many people as possible. It can be a surprising amount of work putting large collections up in any kind of ordered way, though, so don’t be mad if your favorite institution hasn’t done so yet.